You’d have to bury your head in the sand not to have noticed that 2017 is the year of the fermented vegetable. Simply everyone is doing it darling. It’s no surprise that even Tommy Archer, the Ambridge entrepreneur is getting in on the act. 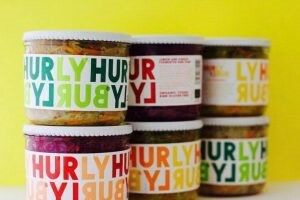 New in the shops are a range of organic fermented slaws from Hurly Burly Foods in London. We really should be doing it ourselves and maybe it’s something for the future but in the meantime we have three flavours of Hurly Burly raw slaws. The turmeric and cumin ones a bit like Malaysian Penang Acar – and would work well with Hainanese chicken and curries.